The key benefit of the Core Collection is that every single Cited Reference or item of a record's bibliography is indexed and can be accessed from a record's overview page. Firstly, locate a single paper using traditional search techniques, which displays in its full record format. For the backward citations, click the Cited References link to access all the research literature used to write the article or paper, also known as bibliography. 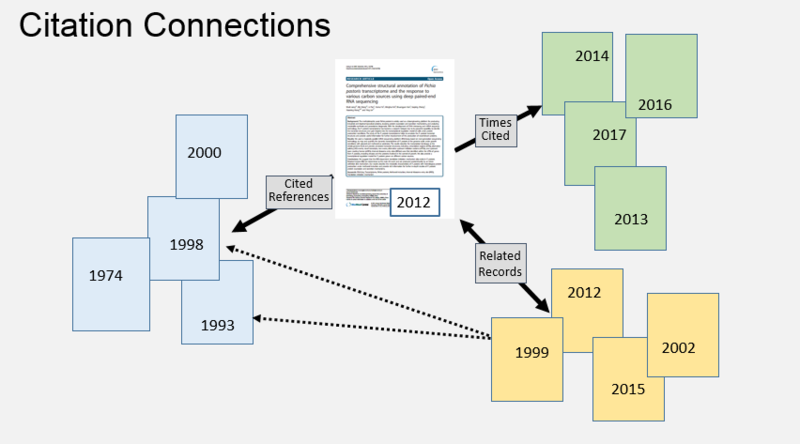 For the forward citations, click the Times Cited link to access the articles or papers citing the viewed record and to get an idea of the more recent developments in citation performance. In addition, you can access Related Records to access the records and research fields that are closely related to the original article. "Related Records" use the concept of bibliographic coupling to establish the relationship; based on the fact that similar items often cite the same literature.